Stir fry is a great dish with veggie and meat versions and the best part is that stir frying seals in the different flavors. 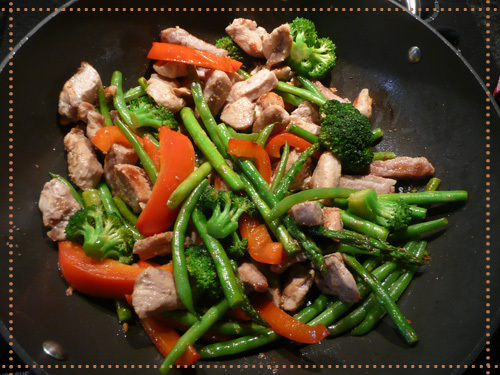 Meat, broccoli, bell peppers, and green beans combine perfectly well in a healthy and satisfying meal. Stir fry comes to the rescue when we are short of time which made it part of our menu and routine dinners. My kids are so crazy about this particular stir fry that I serve it at brunch and lunch as well. It simply tastes superb and I love the fact that it requires little prep. Combine garlic, and soy sauce (balsamic vinegar) and season chicken and pork. Heat olive oil in a large wok and add chicken and pork. Stir-fry for about 20 minutes or until golden brown. Remove the meat from the wok and set aside. In the same wok add the carrots, broccoli, red bell peppers, and green beans and season with salt and pepper. Stir-fry for 7-10 minutes. The veggies need to be crunchy. Be careful not to overcook them. Serve hot in a bowl along with green salad and sprinkle with peanuts or walnuts.